Unlike other lithium extraction processes, the L-Max® process does not require significant amounts of land for evaporation ponds, or costly pyrometallurgical processing routes in order to extract and recover the valuable lithium. 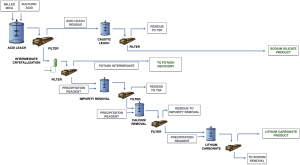 The hydrometallurgical L-Max® process involves direct atmospheric leaching of lithium mica and impurity removal stages with subsequent lithium carbonate precipitation. It differs considerably from the processing of spodumene, which requires high temperature decrepitation and sulphate roasting prior to lithium recovery. 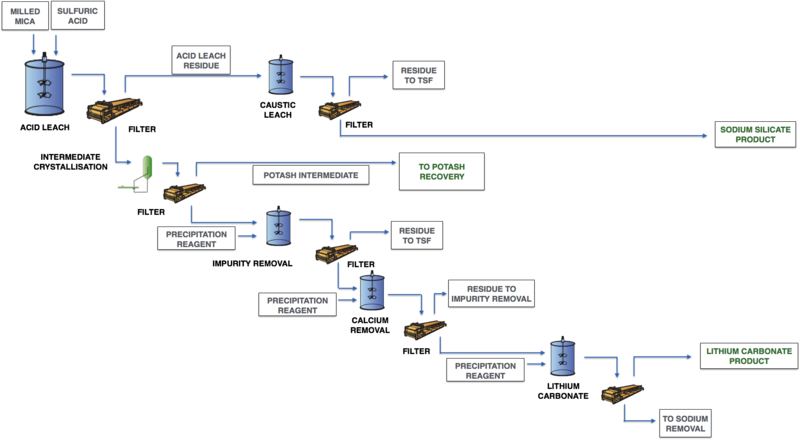 This novel process is simpler, and is expected to have lower energy requirements than existing lithium recovery processes. The processing of lithium micas also allows the production of potassium, rare metal and silicate containing by-products, which will significantly offset the operating costs of lithium carbonate production. The process has been extensively tested in a series of batch laboratory tests and a continuous mini-plant. The flotation of lithium mica from the pegmatite ore is a useful upgrade step and can successfully achieve high lithium recovery. Leaching of the lithium micas has achieved very high dissolution rates in relatively short leaching times. The results from several metallurgical test work programs demonstrate the viability of producing battery grade lithium carbonate and potassium containing fertiliser from the mica material. To find out more about the L-Max® process, please feel free to email us.